It's unclear where it started, but was probably prompted by Facebook's feature that brings back old memories (including pictures) on users' walls. Initially it was called #HowHardDidAgingHitYou as it was supposed to show just that. 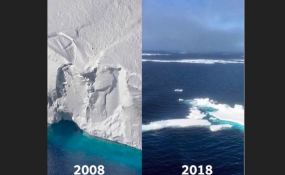 It evolved to #GlowingUp to show how well many aged, before it became known as the #10yearchallenge. Soon it was also all over Twitter and Instagram. Celebrities dined out on it, ordinary people across the world followed suit and participated enthusiastically. On the surface this phenomenon was simply superficial fun. In fact it's provided an interesting window on society. There are two particular insights I've drawn from the explosion of interest in #10yearchallenge. The first is how well people who posted images of themselves have aged. In some cases, there was hardly any change in the participants' faces, hair, weight or bearing. Take global celebrities like Jessica Biel and Rihanna as examples. It could be argued that the #10yearchallenge is providing people with the opportunity to show off their longevity. With mottoes such as "50 is the new 30", not only is the ageing population, particularly in developed countries, growing in numbers, they are becoming younger looking judged by appearances. This obsession with youthfulness, of the older generation looking younger in a distorted inversion of age and youth, reminded me of German director Damir Lukacevic's science fiction film Transfer (2010). It took this future scenario to a potentially dystopian conclusion. It shows how the rich elderly have the opportunity to become "immortal" by swapping bodies with youthful refugees and other marginalised youths. The one group has money and power but time is running out, while the other only have youthfulness on their side. Youthfulness becomes the transferable and highly sought-after commodity. And it highlights how the haves can buy anything, including longevity. Due to this massive digital divide we don't know how the biggest part of the poorer global south aged. We can, however, safely assume that it's nowhere as well as the north. Technology author Kate O'Neil has explained that the #10yearchallenge provides the perfect raw material for setting up a facial recognition algorithm. The then-and-now photographs are ideal for such an exercise - they are clean, simple and helpfully labelled. O'Neil suggests three plausible scenarios for the use of facial recognition. In the benign scenario it could help find missing kids, especially when they've been missing for a while.